Detachable LED light for your Kindle. This stylishly compact MiniFlex eReader Light is made for avid readers like you. The interior of its clip curves to hug the eReader’s edge, so it attaches securely without intruding on the screen. The padded clip works great on books, too. This model attaches to and colour coordinates with most e-readers. If you alternate between e-books and traditional books, so should your reading light! 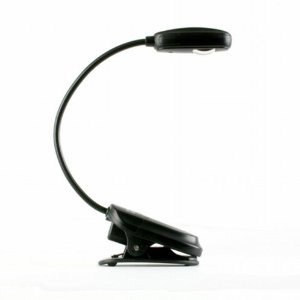 Create the right angle of reading light by bending and twisting its flexible goose neck. It only takes one earth-friendly LED to bathe your screen or page in crystal-clear light and the precision engineered reflector ensures a uniform light is cast and weighing in at only 42 grams you’ll hardly even know it’s there. The MiniFlex eReader Light runs on just 2 ultra-light lithium batteries or plugs into an optional AC adapter. Sized to fit any eReader the bright white energy-efficient LED is durable and lasts for 100,000 hours, that’s 3 hours a day for 90 years! It’s precisely engineered optical grade lens spreads light evenly and its curved clip fits to the top or side edge of your eReader and prevents the base from touching the screen. With 24 hours of battery life from its two lithium batteries (included), you’ll fall asleep before the light runs out! You can also use an external AC adapter (not included) as an alternative to batteries. The flexible goose neck ensures you can get the light shining just how you want it with an infinite number of positions and yet it easily bends to a compact position for easy storage. Bought this for my new Kindle so I can read at night without waking up my OH; does the job perfectly! If anything it's too bright - I have to adjust it so the light doesn't shine back off the screen. Luckily the flexible neck makes this very easy and it's the work of moments to get to a comfortable reading position. The light is perfectly good for reading normal books at night - although probably better with hardbacks or decent sized paperbacks than slimmer volumes. 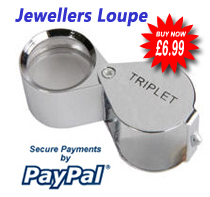 It's also a great utility light for DIY, model making, crafts or any other situation where you need both hands free. The clip is clearly specifically designed for the Kindle as it is shaped to fit the device securely without quite overlapping the screen. However, if you use a Kindle case then the light will also clip securely to the open part of the case. All in all, great little product, very happy with it! . . . .
What better gift for someone who likes to read in bed.